With the unusual heat we’ve been experiencing here in North County San Diego, you wouldn’t know it, but summer is coming to an end. The kids are returning to school (August 18th) which means you can return to the beach and actually find a space to drop your towel in the sand and not every wave is a party wave. 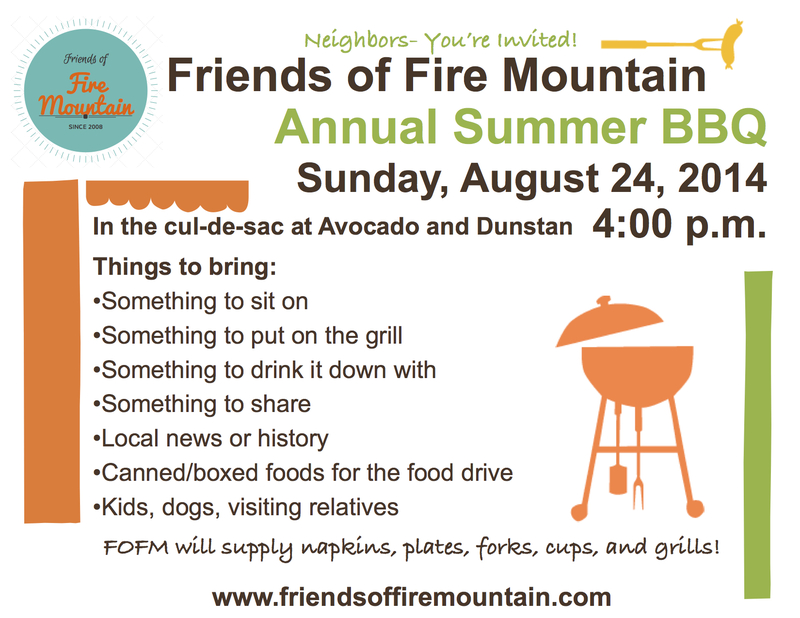 On Fire Mountain we’ll use any reason to celebrate, so join your neighbors at the annual Fire Mountain End of Summer Bar-B-Q, August 24th starting at 4:00 p.m. Meet us at the cul-de-sac on Avocado and Dunstan – bring something to share, something to throw on the grill, something to sip and don’t forget a chair to park yourself. We encourage you to use recyclable/reusable items and to bring a canned or boxed item to donate to the food drive. If you own a local business or charity, feel free to bring some information and we’ll have a table available to display the goods. See you there!